According to Wikipedia, an abecedarium is "an inscription consisting of the letters of the alphabet, almost always listed in order. Typically, abecedaria (or abecedaries) are practice exercises." Related is an abecediary, which they define as "the full alphabet carved in stone or written in book form, historically found in churches, monasteries and other ecclesiastical buildings." 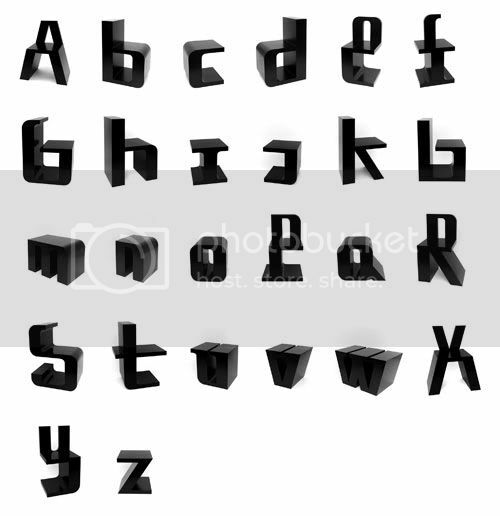 A modern abecedarium could be anything made out of the letters of the alphabet. By a bizarre coincidence, I encountered two very different abecedaria recently. Then I got Abecederia from an English design-oriented publisher, Nobrow. The title refers to a place--a kind of slave labor concentration camp in an African country. But the book is also an abecedarium. 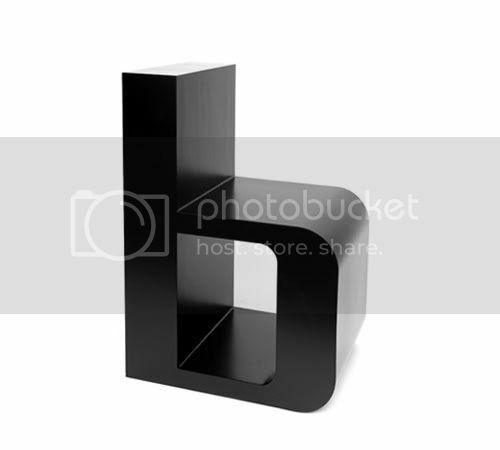 Each page has a large illustration in which a letter of the alphabet forms the main design element. The book has the form and the style of a children's book. But the grim, violent, and frankly disturbing subject matter tells a different story. Two robbers rob a bank, then escape into the jungle to the "colony" of Abecedaria. In it, a German scientist is doing unspeakable experiments on his enslaved prisoners (including our "heroes"). He does this with the apparent connivance of the dictator of Katagonia (which in my mind I thought of being like Zaire under Mobutu, but there are distressingly many possible models). The scientist, Dr. Praxis, has discovered a crash-landed alien, which it is studying--until the alien gets frisky with the narrator. 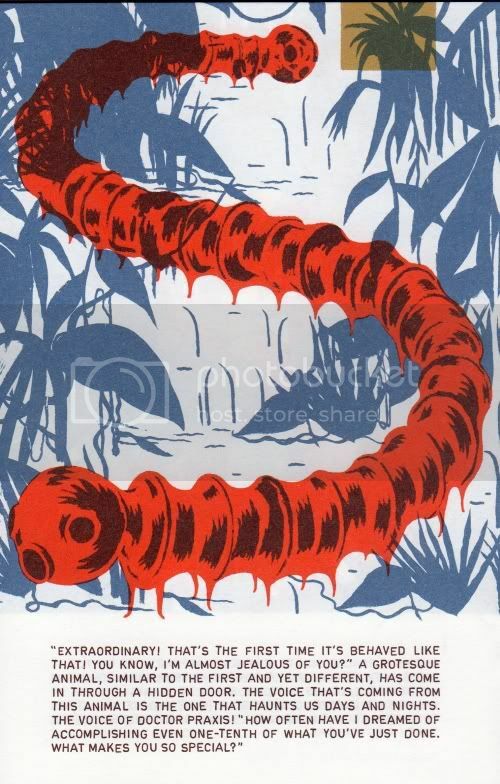 Blexbolex is the pen-name of French cartoonist and children's book illustrator Bernard Granger. A couple of his books have been published in English by Nobrow, and one of his children's books, Seasons, has been published in English by Gecko Press. Nobrow also published preliminary sketches for Abecedaria, if you are interested in seeing a little of Blexbolex's process. 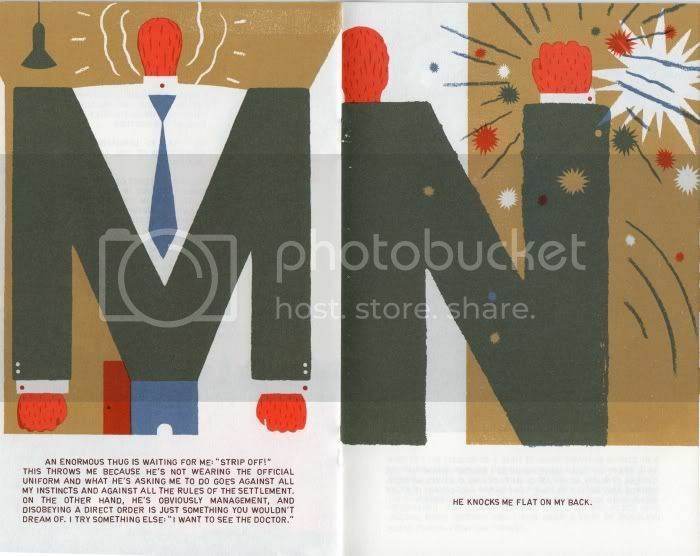 The end result is something stylish and nostalgic, reminding one of children's books from the '60s. This is in bizarre contrast to the grim and lurid story. 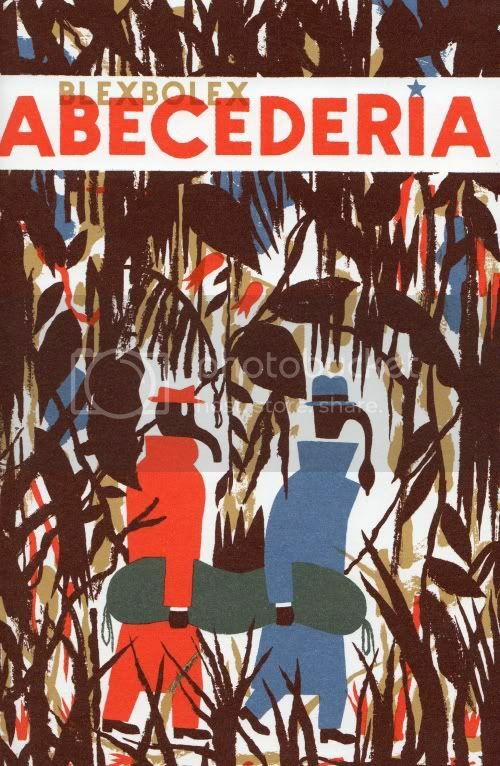 I like to imagine someone sitting in one of the ABChairs reading Abecedaria. Perhaps Otten and Blexbolex should team up to cross-promote their respective abecedaria.